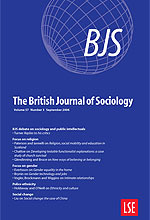 For almost 60 years The British Journal of Sociology (BJS) has represented the mainstream of sociological thinking and research. Consistently ranked highly by the ISI in Sociology (currently ranked 3rd out of 96 with an Impact Factor of 2.449), this prestigious international journal publishes sociological scholarship of the highest quality on all aspects of the discipline by academics from all over the world. The British Journal of Sociology is distinguished by the commitment to excellence and scholarship one associates with its home at The London School of Economics and Political Science. are BJIR (British Journal of Industrial Relations) and Economica.